In the future, highly-sensitive sensors could be able to detect magnetic signals from the body in order to draw conclusions on heart or brain functions. In contrast with established electrical measurement techniques, they would achieve contactless measurement, i.e. without direct skin contact. At present, such measurements are still associated with considerable expense and effort. 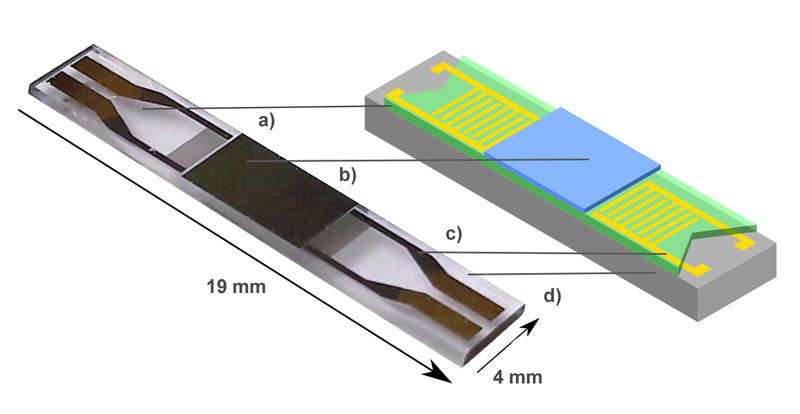 Now, researchers at Kiel University built an important basis for biomagnetic diagnostics. The interdisciplinary research team developed a magnetic field sensor system that not only includes the detection of a magnetic signal, but also its processing. They presented their results in the journal Scientific Reports. In the future, highly-sensitive sensors could be able to detect magnetic signals from the body in order to draw conclusions on heart or brain functions. In contrast with established electrical measurement techniques, they would achieve contactless measurement, i.e. without direct skin contact. At present, such measurements are still associated with considerable expense and effort. This is because the sensors must be cooled dramatically, or shielded against other magnetic fields. Every sensor is only as good as the measuring system in which it is integrated. The members of the CRC described a complete measuring system for the first time - from the sensor to the electronic components - for reading and processing signals. The developed surface acoustic wave sensor is made with a magnetostrictive thin film (b). If a magnetic field occurs, its elastic properties change. It lies on top of a piezoelectric substrate (d), which converts the electric potential of the electrodes (c) into a mechanical pressure into an electrical voltage. The generated acoustic waves spread along the transparent guiding layer (a). Now, researchers at Kiel University built an important basis for biomagnetic diagnostics. In the Collaborative Research Center (CRC) 1261 "Magnetoelectric Sensors: From Composite Materials to Biomagnetic Diagnostics", they are researching the development of magnetic field sensors, which in the long-term - with better spatial resolution - could be easily put to use in medical practice. The interdisciplinary research team developed a magnetic field sensor system that not only includes the detection of a magnetic signal, but also its processing. The researchers presented their results in the journal Scientific Reports. Some diagnoses, such as a suspected heart attack, must be performed quickly. The heart activity can be checked with an electrocardiogram (ECG), for example, where electrodes stuck directly onto the skin measure the electrical signals generated by the heart. 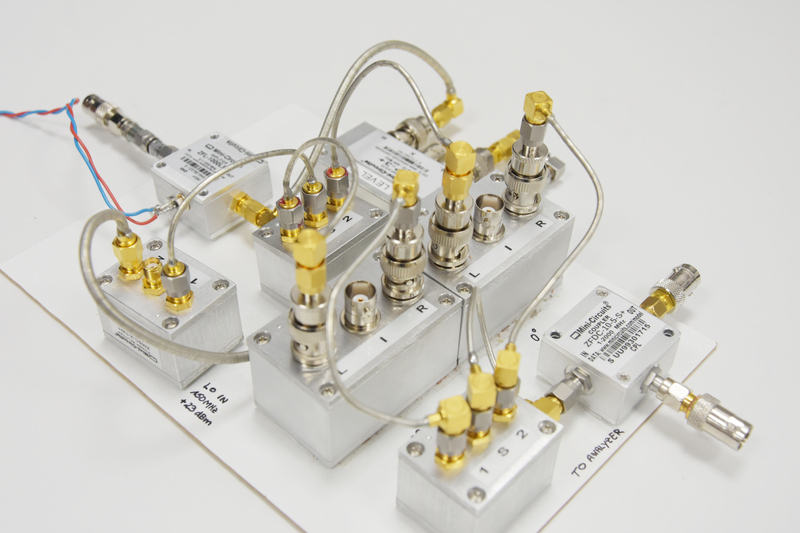 Magnetic measurements could one day be much simpler. “In emergencies, or for long-term studies, they offer the advantage of contactless operation," explained Professor Eckhard Quandt, spokesperson for the CRC 1261. The members of the interdisciplinary research network at Kiel University research and develop various materials and the required electronics for use in magnetic field sensors. "The electrical conductivity of the body also differs in various places, whereas magnetic signals are equally good everywhere," added Quandt, emphasising another advantage of magnetic diagnostics. "In this way, more accurate measurements are possible, with a better spatial resolution." In principle, sensors could thus be moved during the measurement, and signal changes precisely localised. Although there are already sensors that can measure the biomagnetic signals of the body, they only work with superconducting materials. This means that the ambient temperature must be cooled to -197 degrees Celsius, which requires special equipment and is associated with high costs. Therefore, researchers from electrical engineering, physics, materials science and medicine are working closely together in the CRC 1261 to develop magnetic field sensors which can be used at room temperature in medical practice. They have now been able to establish an important basis for this: on the one hand, they developed a surface acoustic wave or SAW sensor. On the other hand, they described the required electronic measuring system, into which it is integrated. Obtaining a meaningful measurement result also depends on how the recorded signals are processed and read. The researchers at the Competence Center Nanosystem Technology at Kiel University produced the SAW sensor using thin-film technology, lithography and etching processes. The key element is a special magnetic material, which is magnetostrictive, i.e. it responds to magnetic fields, in that its elastic properties change and it becomes softer. 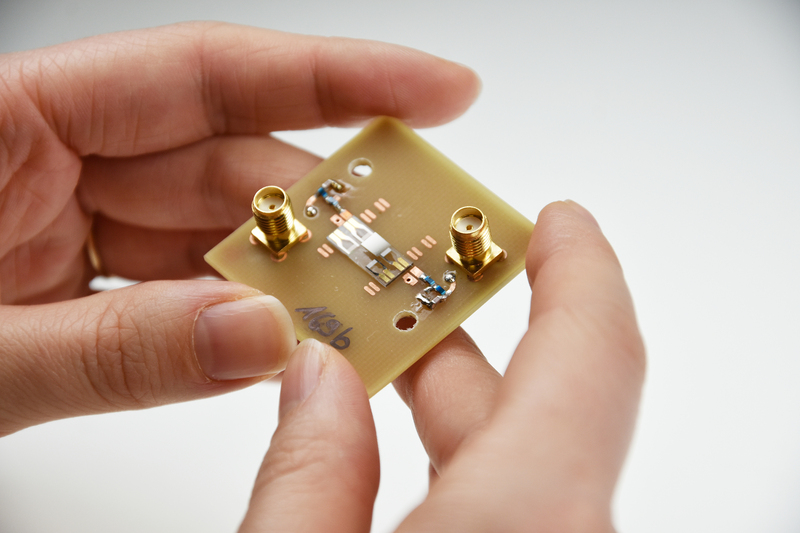 "We send sound waves along the surface of the sensor. If a magnetic field occurs, the waves slow down in the magnetic material," explained Anne Kittmann, a doctoral researcher in materials science at the CRC. The change in speed indicates how strong the magnetic field is. “It is similar with railway tracks: if you place your ear directly on the rail, you can hear an oncoming train earlier. The sound travels faster in the metal than in the air." The biggest challenge in sensor development is interference from other magnetic fields. "Biomagnetic signals are extremely weak. Even the earth’s magnetic field affects their measurement," said Kittmann. Therefore, the sensors have so far been used in measuring chambers, which shield against external magnetic fields. But that is neither practical, nor does it protect against disturbances within the chambers. "Because every electrical component of the measuring system superimposes the magnetic signal with additional noise, i.e. its own interference," added Phillip Durdaut, a doctoral researcher in electrical engineering at the CRC. Together with his colleagues, he was able to optimise the interaction of the individual electronic components, so that their noise is negligible. However, before biomagnetic sensors such as that of the Kiel CRC can be used in medical practice, they must become smaller and more sensitive, for example by modifying the sensor structure, or using additional methods of signal processing. The long-term goal of the researchers is to be able to measure a magnetic field strength in the picotesla to femtotesla range (one trillionth of a tesla). CRC spokesperson Quandt is confident: "The enormous potential of this project lies in the close cooperation of different disciplines and working groups. We can establish important foundations to make magnetic field sensors the long-term standard for cardiological and neurological diagnostics." The findings are also very promising because of the broad frequency ranges of magnetic signals, which makes them potentially useful for other magnetic field sensing applications, e.g. as current sensors for electric mobility. The silver, shiny magnetic field sensors developed by CRC 1261 researchers in Kiel are 19 mm long and 4 mm wide. However, they must become even smaller and more sensitive for medical use. 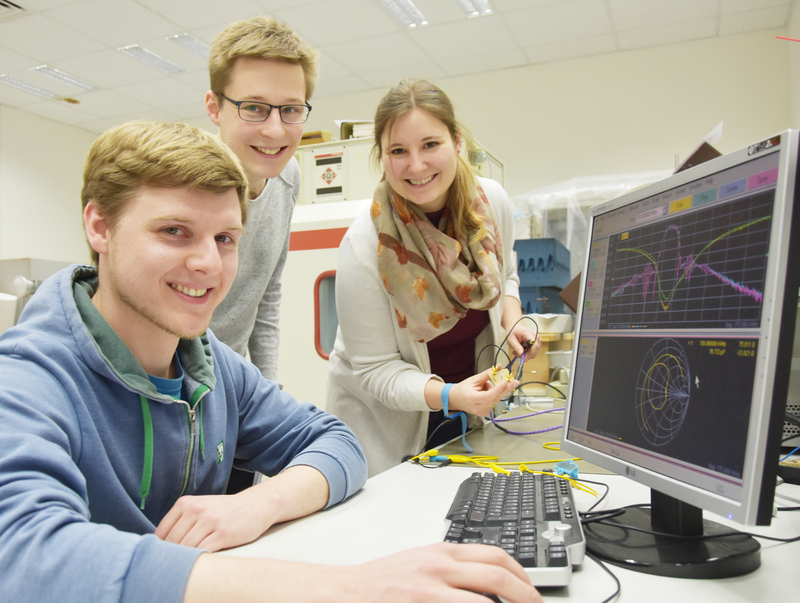 The CRC doctoral researchers (from the left) Phillip Durdaut, Benjamin Spetzler and Anne Kittmann analyse the electrical properties of a sample on a network analyser. Spokesperson for the CRC 1261 "Magnetoelectric Sensors: From Composite Materials to Biomagnetic Diagnostics"